METHODS: One hundred eighty three LC patients were analyzed retrospectively. The primary and secondary endpoints were the incidence of SPM and the OS difference between patients with and without SPM. RESULTS: SPM developed in 22 (12.0%) patients at median 52 months (range, 4–131 months), with a yearly 2.8% incidence, of which 19 (10.4%) and 3 (1.6%) were metachronous and synchronous, respectively. Lung was the commonest SPM (72.7%). Of 47 deaths, 12 (25.5%) were SPM related. Comparatively SPM patients had significantly shorter median OS (68.0 months vs. median not reached; P = 0.005), with lower 5-year (67.0% vs. 78.9%) and 8-year (32.6 vs. 69.8%) survival rates. CONCLUSION: The present findings suggested the SPM as a competing risk factor for death in index LC patients with its annual incidence rate of 2.8% and for accounting one of every four deaths in this patients group. 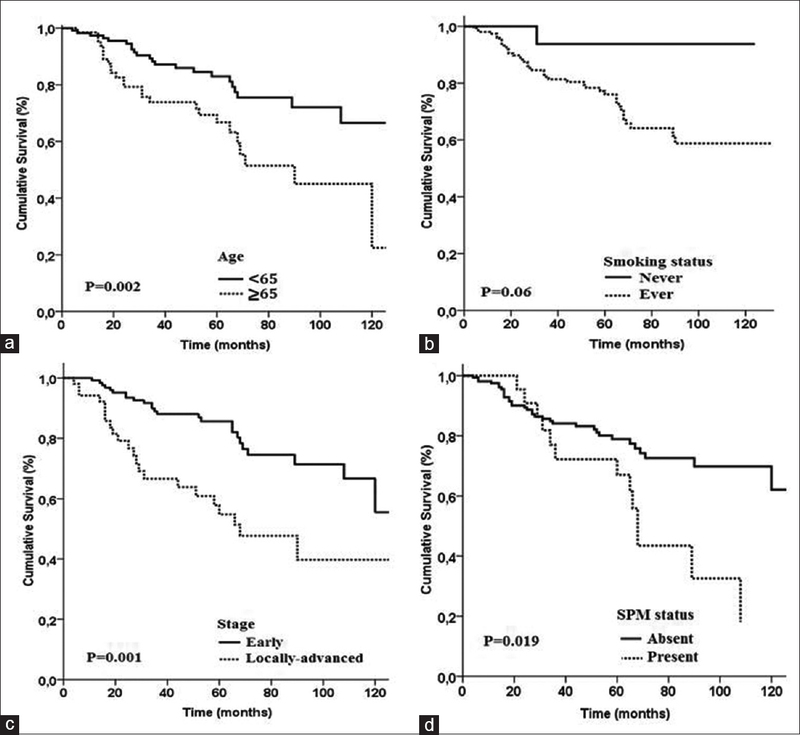 Emergence of lung carcinoma as the most frequent type of SPM and the ability to treat >50% of them with an estimated long-term outcomes emphasizes the importance of early diagnosis and curative treatment of SPMs. Laryngeal carcinoma (LC) is one of the few malignancies that has exhibited a decrease in 5-year survival over the last decade despite the gradual decline in incidence and significantly improved treatment and staging modalities. Although debated, the treatment shift in favor of organ preserving radiotherapy (RT) for locally advanced disease (LAD) has been suggested to explain this unexpected reduction, which does not fit for early stage LC regarding the similar treatment efficacy of RT and surgery in this stage. In patients with LC, particularly those with earlier stages, a significant source of morbidity and mortality is the emergence of second primary malignancies (SPMs) during the follow-up period, which may be associated with aging, genetic factors, and lifestyle including tobacco and alcohol abuse., Representing one-third of any deaths, the incidence of SPM is 2%–6% per year and with a cumulative risk of nearly 40% at 20 years for any head and neck cancers (HNC).,, The long-term cumulative SPM risk in patients with LC are reported to be in the range of 9.6%–29% which is in line with the other HNC investigations., In the view of improvements in diagnostic and therapeutic techniques in the last few decades, there may be some variations in the incidence and outcomes of LC patients with SPM compared to the historical series. Therefore, we analyzed the incidence of SPM and its impact on survival outcomes in LC patients treated with definitive RT. We performed a search of patients undergoing definitive RT and/or chemoradiotherapy (CRT) over a time period of January 2007 to April 2017 after the approval of the retrospective study design by the institutional review board. All the clinical data analyzed here were anonymized; therefore no ethical concerns were noted. Patients who fit the following criteria were included in the analysis: age >18 years; histologically proven squamous cell LC; ≥6-month follow-up period; treatment modalities including definitive RT or CRT without previous laryngeal surgery; and the availability of medical and RT datasets. The study protocol was approved by the institutional review board before collection of any data. All patients underwent curative RT: Fractionation schedules were 64.4 Gy for T1N0M0 and 66.7 Gy for T2N0M0 given in 2.3 Gy daily fractions, and 70 Gy, 59.4 Gy, and 54 Gy administered in 33 fractions for LAD respecting the risk volumes. Concurrent chemotherapy was utilized in all patients, except those with T1-T2N0. Patients were examined at weekly intervals or more frequently when necessitated during the treatment course. Accordant with our institutional standards, the follow-up evaluations were scheduled at every 3 months for the first 2 years, every 6 months for 2–5 years, and annually, thereafter. The first treatment response was assessed at 3 months of the completion of RT/CRT and incorporated the fiber-optic examination, and PET-CT (if achievable) or CT scans respecting the baseline imaging in use. At subsequent follow-up visits, patients with T1-T2N0M0 were monitored with routine fiber-optic laryngoscopy and chest X-ray, while ultrasound and/or CT of the neck were added for evaluations of LAD. Although some authors describe SPM as any tumor emerging at least 6 or 12 months after the diagnosis of the index tumor, which better fits the metachronous second tumor definition., On the other hand, a synchronous malignancy is diagnosed simultaneously or within the 6 months of index malignancy. Currently, the Hong's modified Warren and Gates definition is more frequently used with its specified criteria: If the SPM is histologically identical with the index malignancy, than an interval of minimum 3 years between the two diagnoses or a minimum of 2 cm tumor-free gap from the index malignancy is mandated to rule out the local relapses. In our current investigation, both the synchronous and metachronous SPMs were included with exclusion of the cases within the 2 cm of index LC. The primary endpoint was to determine the incidence of SPM; the secondary endpoint was to assess differences in survival outcomes between patients with and without SPMs. Descriptive statistics and Kaplan–Meier curves were performed to evaluate the frequencies of SPMs in the population and to estimate overall survival (OS), respectively. Statistical differences in OS between the groups with and without SPM were measured by two-sided log-rank test, with statistical significance set at P < 0.05. The OS was defined as the interval between the first day of RT and the last visit/death date. Receiver operating curve (ROC) analysis was utilized to determine potential cut-offs for continuous variables. A comparison of demographic features between the two cohorts was carried out using the Pearson χ2 test. In multivariate analyses, the Cox proportional hazards model was used to evaluate the relationship between different variables and survival outcomes by including only the factors exhibiting significance in univariate analysis. Correlations between two factors were assessed with Spearman's test. Retrospective analysis of medical records from 183 patients with LC treated with RT or CRT between 2007 and 2017 was performed. 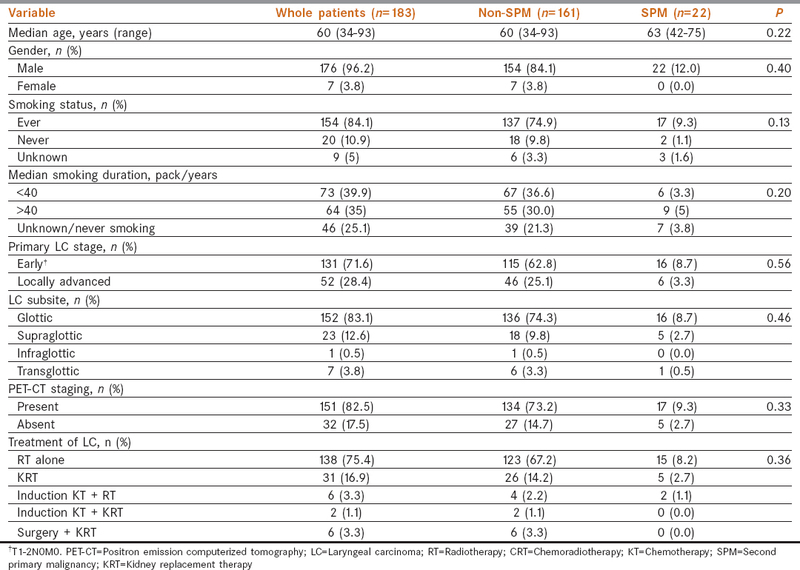 Patient and treatment characteristics for the whole study population and per SPM status were summarized in [Table 1]. Median follow-up time was 52 months for the entire cohort (range, 4–131 months). Median age for the study population was 60 years (range, 34–93). Most patients were male (96.2%) and had T1-T2N0M0 (71.6%) disease. Of 183 patients, 22 (12.0%) developed SPM: 3 (1.6%) synchronous and 19 (10.4%) metachronous. During the 52-month follow-up, we found an incidence of 2.8% SPM per year. The median time from LC to SPM diagnosis was 34.5 months (range, 0–105). Of the 22 SPM, 16 (84.2%) occurred in patients with T1-T2N0M0 primaries, with non-small cell lung carcinoma [68.7% squamous cell carcinoma (SCC) and the remaining adenocarcinoma] the most frequent was SPM type (72.7%), followed by two cases of oral cavity (SCC) (9.1%) and the remaining were carcinomas of esophagus (adenocarcinoma), kidney (renal cell carcinoma), liver (hepatocellular carcinoma), and skin (SCC), one case per organ. During this final analysis 136 (74.3%) patients were still alive. Of all deaths, 59.5% (n = 28), 25.5% (n = 12), and 15% (n = 7) were related to LC, SPM, and other reasons, respectively. For the whole cohort the median OS time was not reached during this final analysis with 5- and 10-year OS rates of 78% and 52.6%, respectively [Figure 1]. During the analysis, 9 of 22 (40.9%) SPM patients were still alive and 13 of 22 (59.1%) SPM patients had died because of lung cancer (n = 8; 61.5%), oral cavity cancer (n = 2; 15.4%), esophageal cancer (n = 1; 7.7%), kidney cancer (n = 1; 7.7%), and cerebrovascular stroke (n = 1; 7.7%). Of the nine surviving SPM patients, eight (88.9%) had curable early stage lung carcinomas (T1-T2N0M0) treated with either surgery or radiosurgery. In comparative analyses, the SPM cohort had significantly worse median OS compared to the non-SPM patients (68.0 months vs. not reached yet; P = 0.005), with 5-year (67.0% vs. 78.9%) and 8-year (32.6 vs. 69.8%) survival favoring the non-SPM cohort [Figure 2]. As evident, the major cause of death was SPM itself in this group (n = 12/13; 92.3%) with lung cancer dominancy (n = 8/13; 61.5%). The results of univariate analyses including the factors depicted in [Table 2] demonstrated the age >65 (P = 0.003), being ever smoker (P = 0.043), locally advanced LC (P < 0.001), and presence of SPM (P = 0.005) as the factors associated with significantly shorter median OS times. In multivariate analyses, including only these factors, all except for smoking status (P = 0.06) retained their independent relation with longer OS times [Table 2]. Results from the present study cohort of 183 patients with LC were consistent with the current literature of HNC with SPMs: we observed an SPM cumulative incidence of 12.0% at the 52-month median follow-up corresponding to a yearly incidence of 2.8%, where lung carcinoma (72.7%) constituted the most common SPM type. 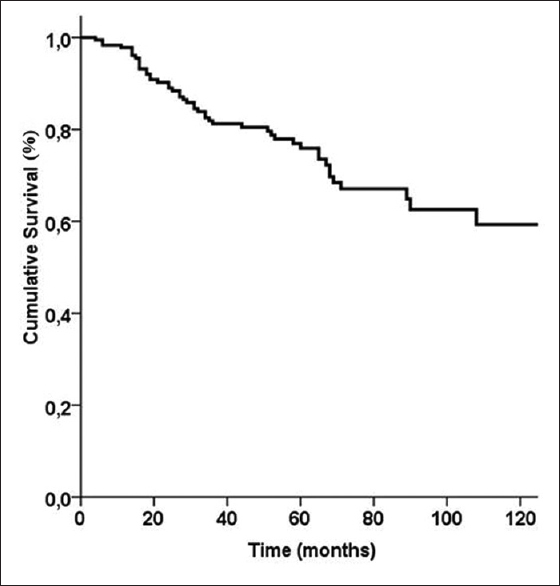 Our additional observation of SPM as the cause of 25.5% of all deaths in this patient group highlights its negative influence on survival outcomes in LC patients undergoing curative RT. Finally, underlining the importance of implementation of timely curative treatment strategies into the management algorithm of such patients, 50% (n = 8/16) of the patients with lung carcinoma were still alive at the time of analysis. The present 2.8% yearly incidence of SPM is accordant with the reported range of 2%–6% SPM incidence notified previously, while our 12.0% cumulative SPM risk at 52 months of follow-up appears to be in the lower range of cumulative long-term SPM risk reports with a range of 11%–29%. Considering the correlation between the yearly incidence rates reported here and the others elsewhere, it is rational to explain this finding with mainly our relatively short follow-up time of only 52.0 months, and to anticipate further increments with lengthened follow-up periods. Similar to the previous reports, we demonstrated that lung cancer was the most frequent accounting for 72.7% of all SPMs, that is similar or a bit higher than the reported 61.5% for any HNC series. Nevertheless, it is logical to express this difference with the relatively higher tendency of LC patients to develop subsequent lung cancers compared to their counterparts with index oral cavity cancers who are more prone for second HNCs as SPMs. However, this logical assumption may only partially explain the relationship between the index LC and lung cancer as the most common SPM type, as many other factors may play significant roles. For instance; the oral cavity, pharynx, larynx, and the other aerodigestive tract organs including the esophagus and lung are the common potential destinations of dysplastic changes as a result of long-term exposure to carcinogenic agents, such as tobacco and alcohol. Considering the field cancerization phenomenon, pre-malignant and malignant changes may emerge in organs at the vicinity of index cancer or at more distant organs sharing the same risk factors. Furthermore, particular to our country, the intensive smoking habit with a median 40 packs/year in our cohort and proven initiation of tobacco use at earlier ages (<16 years) may be the additional strong factors for the present lung cancer dominancy. Previous RT for the index cancer should be also considered as another risk factor for SPM. Although RT has previously been accused for only the 8% of the all SPMs and some reports decreased SPM rates with intensity-modulated RT (IMRT), considering the stochastic nature of carcinogenic effects of ionizing radiation, we believe that this notion should be reassessed in the era of IMRT which no doubt increases the low-dose bath volume. From this point of view, 34.5 months of median latent time for SPM development in our cohort appears to be short compared to the 5 years of latency period defined for the radiation-induced secondary cancers. In addition to the time factor, the long distance between the metachronous malignancies and initial RT field supports the classification of these malignancies as SPMs rather than the radiation-induced counterparts. SPM has been reported to be associated with diminished OS in patients with HNC. The results of a retrospective study by Chu et al. demonstrated that 10-year OS was 11% higher in non-SPM patients compared to those with SPM in 581 patients with laryngeal and hypopharyngeal carcinomas treated with radical surgery with/without RT. Likewise, in a study of 240 early stage LC patients (T1-T2N0M0) treated with radical RT, 5-year OS was significantly higher in the non-SPM cohort (70% vs. 55%; P < 0.05). Supporting these studies, our present results also revealed that the SPM cohort had significantly lower median and long-term survival rates compared to their non-SPM counterparts [Table 2]. Given the impact of SPM location on prognosis, it is reported that SPMs in the head and neck region are associated with better prognosis than SPMs in other regions of the body, especially the lung or esophagus., This may be related to the more aggressive tumor types and detection of these SPMs at an untreatable late stage. However, because of the high lung cancer incidence in the present study, a separate survival analysis was not performed according to SPM type. On the other hand, 61.5% of the mortality observed in the SPM cohort was associated with lung cancer, which is accordant with the relevant literature. Another important result of the current investigation was the observation that one out of every four deaths in the entire LC cohort was SPM related, which underlines the need for implementation of habitual, early diagnostic, and chemo-preventive measures into the management algorithms of such patients, particularly those presenting with early stage disease. In this context, as the lung cancers constitute the majority of the SPMs with >90% being tobacco-related, massive campaigns against the tobacco abuse gains further importance regarding its high preventive efficiency in breakage of the this causal relationship. Emphasizing the importance of early diagnosis of lung cancer as a SPM in its potentially curable earlier stages, the investigators of the benchmark Lung Cancer Screening Trial reported a relative 20% reduction in lung carcinoma mortality in the high risk population undergoing low dose CT compared to those screened with plain radiographs. In respect to the evidence suggesting detectability of only 33% of the thoracic lesions by chest X-ray which are evident in CT scans, it appears logical to incorporate annual low-dose thoracic CT as an efficient strategy in screening of such patients group. Regarding the chemo-preventive measures, agents with the inhibitory actions on various steps of the carcinogenesis process including the 13-cisretinoic acid, cyclooxygenase-2 inhibitors, and epidermal growth factor receptor inhibitors in HNC has been studied with some encouraging outcomes;, such as reduction of SPM rates from 24% to 4% (P = 0.005) in HNC patients receiving 13-cisretinoic acid. The present investigation is strengthened with some factors:First, the study population is homogeneous by exclusive inclusion of LC patients. Second, presence of the highly sensitive and specific PET-CT in the initial staging procedure in 82.5% patients may have increased our chance for detection of synchronous SPMs as well as for more accurate staging of the index LC. In contrast, our study also has some limitations:First, this was a single institutional experience with a relatively short follow-up duration. Second, while the previous reports mainly favored the metachronous SPMs over the synchronous ones, we could not perform any comparative analysis between the two SPM types as synchronous SPMs constituted only 13.6% of all SPMs. And third, the differences between the salvage maneuvers may have altered the outcomes of the loco-regionally relapsed patients, warranting to be investigated in further studies with a larger study populace. In conclusion, the present study demonstrated that SPMs, which occur with a cumulative incidence of 12.0% at 52 months in pure LC patients, are considerable competing risk factors for cancer-related deaths by accounting for one of every four deaths in this patient group. Additionally, lung carcinomas were the most common SPM type by comprising 72.7% of all SPMs. Because this type of SPM can be cured by early diagnosis and appropriately selected treatment approaches, our findings emphasize the importance of regular screening of LC patients for SPM. Although the informed consent before each treatment was available at our institution, there was no any informed consent specifically for the study because of the retrospective characteristic of the investigation including computer data. Cooper JS, Pajak TF, Rubin P, Tupchong L, Brady LW, Leibel SA, et al. Second malignancies in patients who have head and neck cancer: Incidence, effect on survival and implications based on the RTOG experience. Int J Radiat Oncol Biol Phys 1989;17:449-56. Licciardello JT, Spitz MR, Hong WK. Multiple primary cancer in patients with cancer of the head and neck: Second cancer of the head and neck, esophagus, and lung. Int J Radiat Oncol Biol Phys 1989;17:467-76. Berrington de Gonzalez A, Curtis RE, Kry SF, Gilbert E, Lamart S, Berg CD, et al. Proportion of second cancers attributable to radiotherapy treatment in adults: A cohort study in the US SEER cancer registries. Lancet Oncol 2011;12:353-60. Sankaranarayanan R, Masuyer E, Swaminathan R, Ferlay J, Whelan S. Head and neck cancer: A global perspective on epidemiology and prognosis. Anticancer Res 1998;18:4779-86. Khuri FR, Kim ES, Lee JJ, Winn RJ, Benner SE, Lippman SM, et al. The impact of smoking status, disease stage, and index tumor site on second primary tumor incidence and tumor recurrence in the head and neck retinoid chemoprevention trial. Cancer Epidemiol Biomarkers Prev 2001;10:823-9. Morris LG, Sikora AG, Patel SG, Hayes RB, Ganly I. Second primary cancers after an index head and neck cancer: Subsite-specific trends in the era of human papillomavirus-associated oropharyngeal cancer. J Clin Oncol 2011;29:739-46. León X, Quer M, Diez S, Orús C, López-Pousa A, Burgués J, et al. Second neoplasm in patients with head and neck cancer. Head Neck 1999;21:204-10. Wagenfeld DJ, Harwood AR, Bryce DP, van Nostrand AW, DeBoer G. Second primary respiratory tract malignancies in glottic carcinoma. Cancer 1980;46:1883-6. Patrucco MS, Aramendi MV. Prognostic impact of second primary tumors in head and neck cancer. Eur Arch Otorhinolaryngol 2016;273:1871-7. Goldfarb M, Rosenberg AS, Li Q, Keegan THM. Impact of latency time on survival for adolescents and young adults with a second primary malignancy. Cancer 2018;124:1260-8. Yesensky J, Kyrillos A, Kuchta K, Yao K, Wang CH, Bhayani MK, et al. Risk of development of second primary head and neck cancer following an index breast cancer. Otolaryngol Head Neck Surg 2018;158:303-8. Hong WK, Lippman SM, Itri LM, Karp DD, Lee JS, Byers RM, et al. Prevention of second primary tumors with isotretinoin in squamous-cell carcinoma of the head and neck. N Engl J Med 1990;323:795-801. Morris LG, Sikora AG, Hayes RB, Patel SG, Ganly I. Anatomic sites at elevated risk of second primary cancer after an index head and neck cancer. Cancer Causes Control 2011;22:671-9. Chuang SC, Scelo G, Tonita JM, Tamaro S, Jonasson JG, Kliewer EV, et al. Risk of second primary cancer among patients with head and neck cancers: A pooled analysis of 13 cancer registries. Int J Cancer 2008;123:2390-6. Slaughter DP, Southwick HW, Smejkal W. Field cancerization in oral stratified squamous epithelium; clinical implications of multicentric origin. Cancer 1953;6:963-8. Oztürk AB, Kiliçaslan Z, Işsever H. Effect of smoking and indoor air pollution on the risk of tuberculosis: Smoking, indoor air pollution and tuberculosis. Tuberk Toraks 2014;62:1-6. Sethi RV, Shih HA, Yeap BY, Mouw KW, Petersen R, Kim DY, et al. Second nonocular tumors among survivors of retinoblastoma treated with contemporary photon and proton radiotherapy. Cancer 2014;120:126-33. Tsou YA, Hua CH, Tseng HC, Lin MH, Tsai MH. Survival study and treatment strategy for second primary malignancies in patients with head and neck squamous cell carcinoma and nasopharyngeal carcinoma. Acta Otolaryngol 2007;127:651-7. Chu PY, Chang SY, Huang JL, Tai SK. Different patterns of second primary malignancy in patients with squamous cell carcinoma of larynx and hypopharynx. Am J Otolaryngol 2010;31:168-74. Vaamonde P, Martín C, del Río M, LaBella T. Second primary malignancies in patients with cancer of the head and neck. Otolaryngol Head Neck Surg 2003;129:65-70. Birkeland AC, Rosko AJ, Chinn SB, Prince ME, Sun GH, Spector ME, et al. Prevalence and outcomes of head and neck versus non-head and neck second primary malignancies in head and neck squamous cell carcinoma: An analysis of the surveillance, epidemiology, and end results database. ORL J Otorhinolaryngol Relat Spec 2016;78:61-9. Jayaprakash V, Cheng C, Reid M, Dexter EU, Nwogu CE, Hicks W, et al. Previous head and neck cancers portend poor prognoses in lung cancer patients. Ann Thorac Surg 2011;92:1056-60. 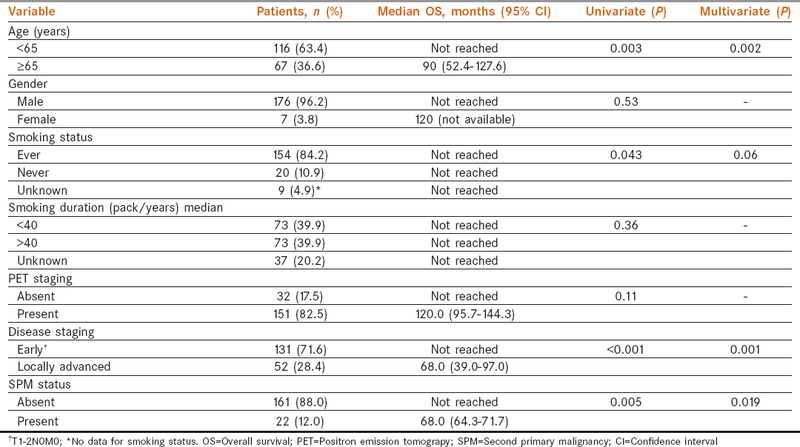 Tamjid B, Phan P, John T, Mitchell P, Gan H. Outcomes for patients with synchronous and metachronous primary lung cancer after diagnosis of head and neck cancer. Head Neck 2017;39:1544-9. Mortani Barbosa EJ Jr. Lung cancer screening overdiagnosis: Reports of overdiagnosis in screening for lung cancer are grossly exaggerated. Acad Radiol 2015;22:976-82. National Lung Screening Trial Research Team, Aberle DR, Adams AM, Berg CD, Black WC, Clapp JD, et al. Reduced lung-cancer mortality with low-dose computed tomographic screening. N Engl J Med 2011;365:395-409. Bhatia A, Burtness B. Novel molecular targets for chemoprevention in malignancies of the head and neck. Cancers (Basel) 2017;9. Kitani Y, Kubota A, Furukawa M, Hori Y, Nakayama Y, Nonaka T, et al. Impact of combined modality treatment with radiotherapy and S-1 on T2N0 laryngeal cancer: Possible improvement in survival through the prevention of second primary cancer and distant metastasis. Oral Oncol 2017;71:54-9. Benner SE, Pajak TF, Lippman SM, Earley C, Hong WK. Prevention of second primary tumors with isotretinoin in patients with squamous cell carcinoma of the head and neck: Long-term follow-up. J Natl Cancer Inst 1994;86:140-1. Xu GZ, Guan DJ, He ZY. (18)FDG-PET/CT for detecting distant metastases and second primary cancers in patients with head and neck cancer. A meta-analysis. Oral Oncol 2011;47:560-5. Spencer SA, Harris J, Wheeler RH, Machtay M, Schultz C, Spanos W, et al. Final report of RTOG 9610, a multi-institutional trial of reirradiation and chemotherapy for unresectable recurrent squamous cell carcinoma of the head and neck. Head Neck 2008;30:281-8.